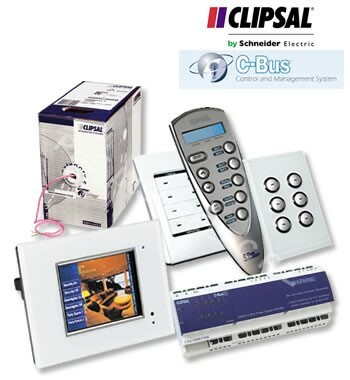 Clipsal Cbus is an Australian designed and manufactured microprocessor controlled wiring system that offers complete control of lighting and other electrical services. Cbus will control virtually any type of electric load with ease, whether it’s simple digital control of a lighting circuit, or a variable type control, such as dimming of electronic LED equipment. To ensure fast and reliable operation, each device has its own in-built microprocessor and can be individually programmed to integrate with other Cbus devices. Control of lighting, blinds, Audio visual equipment, pool and spa pumps, is achieved with the use of sensors, switches, or touchscreens. Programming of different scenes enables the desired environment to be achieved. The programming of set scenes is an important tool especially in a hospitality environment where consistency is key and gives management piece of mind that lighting levels are consistent day in and day out. Cbus can also interface with security, DALI lighting, IP cameras and access controls of other systems. Clipsal Cbus gives users total control of their installation from any location via the use of an app on a smart phone. Adelaide Sky City Casino; Barossa Room, Sean’s Kitchen, VIP room and Champagne Bar. Adelaide Hilton Hotel; Ground Floor/Cole Cellar renovation and new Gym project. Tonsley Precinct; SAGE Automation, MAB 12a,12b &14 and Innovyz Fitout. Port Augusta Sterile Insect Facility; New laboratory. Adelaide Convention Centre; Adelaide Event Management Fitout.